Newly commissioned Navy and Marine Corps officers toss their hats during the U.S. Naval Academy Class of 2011 graduation and commissioning ceremony. 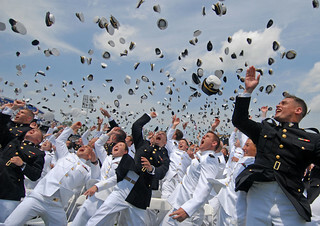 The Class of 2011 graduated 728 ensigns and 260 Marine Corps 2nd lieutenants at Navy-Marine Corps Memorial Stadium in Annapolis, Md.